The Pentagon, the largest low-rise office building in the world, is actually located in Arlington, VA just outside of Washington. An imposing structure, the Pentagon is easily visible from the highway, Arlington National Cemetery and Washington, DC. Headquarters for the US Department of Defense, the Pentagon is so large that the Capitol Building could fit in any one of its five sections. The building itself has more than 17 miles of hallways. It contains enough telephone line to wrap the circumference of the world 4.5 times — around the globe four times! Wow! There are lots more cool details, but I don’t want to spoil the tour fun facts for you! Pentagon tours must be requested in advance. Tickets must be requested at least 14 and no more than 90 days before visiting. To request a visit, reserve Pentagon tours here. A member of the tour party should schedule it as you will be the only point of contact throughout the process. 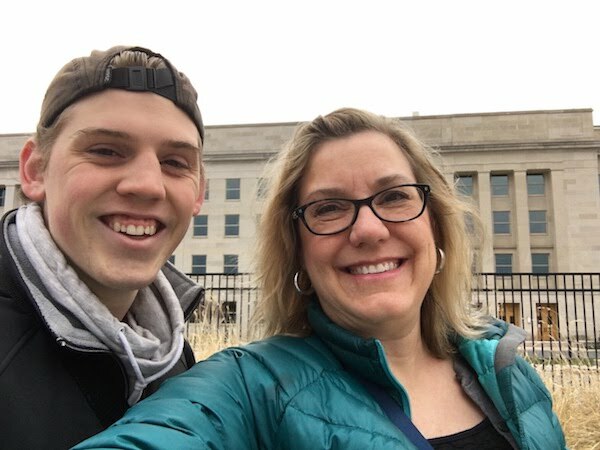 All Pentagon tours are FREE! Pentagon tours are available by reservation only. Reservations MUST BE made 14-90 days before visiting. The earlier you schedule, the better as tours fill up — especially during peak travel season (spring break, summer and holidays). You will need your social security number to reserve your spot. Tours are offered Monday-Thursday from 10 a.m. to 4 p.m. and Fridays from Noon to 4:00 p.m. Tours are not offered on weekends or federal holidays. EVERYONE age 18 and over must provide a photo ID to tour the Pentagon. See the site for acceptable forms of ID. (We took our passports). Expect a lot of walking on your Pentagon tour (1.5 miles of walking) and dress appropriately. That means comfortable walking shoes! Then, make sure you remember that photo ID! Finally, remember that you’ll be searched on arrival. Large bags are not allowed. You’ll have to remove your shoes, belt and empty your pockets, just like the airport. So, travel lightly. A note from my experience: I wore a tank top and fitted cardigan the day of my Pentagon tour — and the screening agent made me remove my sweater! I almost hyper-ventilated there, thought (momentarily) about refusing to comply and then decided against it. Arguing with the security guy seemed imprudent. GAH! Instead, mortified, I took off my sweater, reminded myself that teenagers wear camisole tops as regular clothes all the time AND that it covers more than my swimsuit does. And, I secretly thanked God that I’ve been working out for a little while. It could have been worse. But there you go — security is a BIG DEAL at the Pentagon. Skip the tank top and sweater combo! Arrive 60 minutes before your scheduled tour to allow time to go through security. First checkpoint: A security stand outside the visitor’s entrance where a guard checks ID and purpose for your visit before you go inside. If you get there before you can go inside (for us that was 30 minutes before our visit — but it varies), they will not let you inside. Indoors: Present your ID at a window where they’ll confirm you are scheduled. Then, proceed through security screening — shoes, belts, watches and jackets (and in my case, sweaters) must be removed and all pockets emptied. Think TSA! After screening, head to a waiting area and wait! You’ll find displays for each branch of the military, a small gift shop and restrooms in this area. The military displays are behind the gift shop. We didn’t see them before our tour — so I missed that opportunity! Bummer. Pentagon tours are led by an active duty members of one of the five Ceremonial Guards (Army, Marine, Navy, Air Force, and Coast Guard). Tours begin in a theater where the guides explain the rules, especially about photography, making sure your visitor’s badge is always visible and staying together, and then proceed on foot. 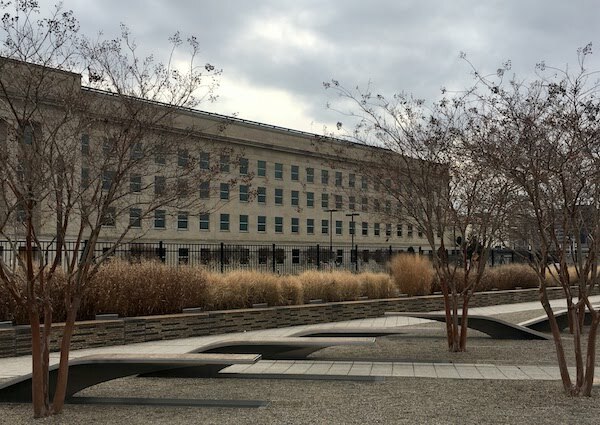 Since the Pentagon is essentially a large office building, you’ll see exactly that — offices and corridors and escalators! 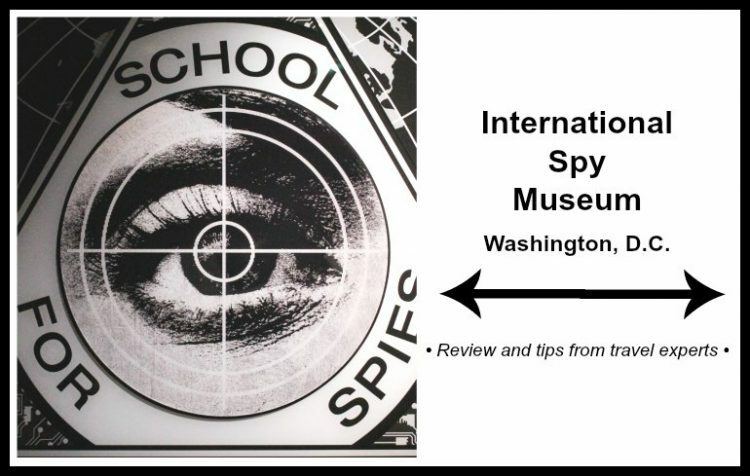 But, along the way, you’ll learn a little history of each branch of the military and get to see (briefly) the inner courtyard and the indoor 9/11 Memorial and chapel. Displays along the corridors help tell the story. The guides add in some fun tidbits. I won’t ruin it for you but one of my favorites was the story of the hotdog stand. I also found it quite interesting that because of its unique design, you can get from any one point in the Pentagon to any other point in the building in only seven minutes! For a place so enormous, that’s incredible! 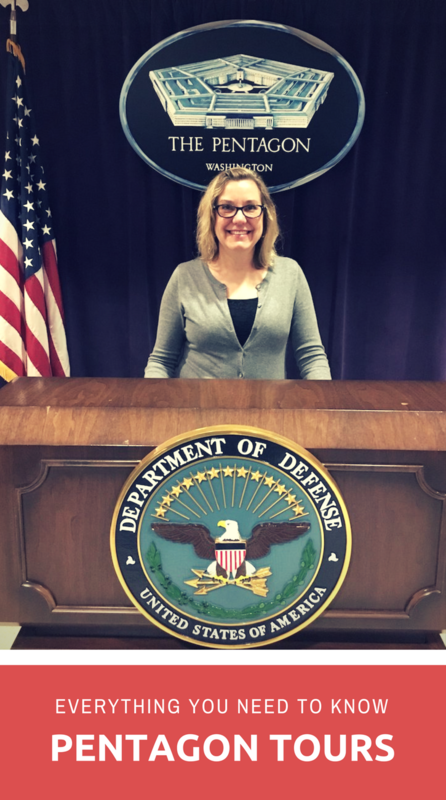 All in all, I’m glad I toured the Pentagon. I was surprised to learn they have a shopping area and food court. Though, it makes sense. Most gigantic office complexes have food courts and shopping onsite, right? But, overall, the Pentagon is basically an office building. Seen one, seen ’em all? And, because the tours are so short, there is little time to actually read the information on the displays you pass. You only learn what the guide shares orally. Overall, I found the tour underwhelming. I’m glad I went, but I don’t recommend it to those with limited time in the nation’s capital. Ben, age 20, agrees. He was looking forward to touring the Pentagon, too. Like me, though, he found it to be less exciting than he had hoped. 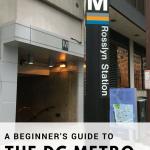 The DC Metro for beginners: It’s easy — and affordable. 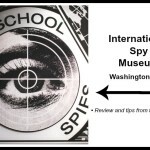 International Spy Museum, in DC — Great for families! 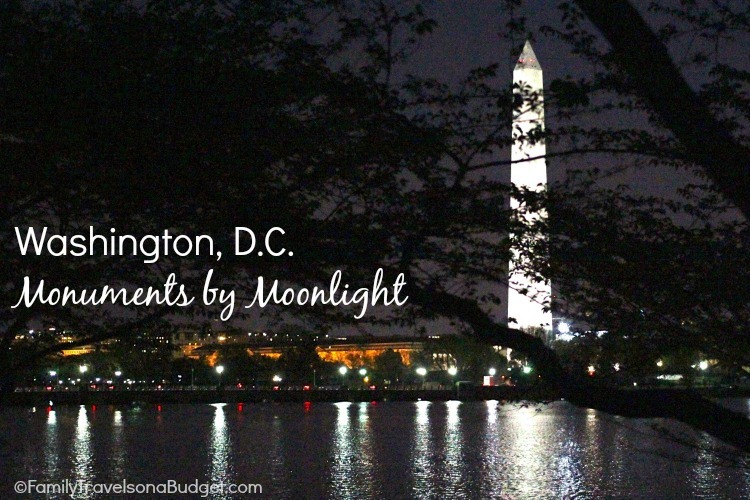 I haven’t been to DC in ages, but I want to take my kids soon. This is a perfect guide for the Pentagon! I wasn’t even aware that you could tour the Pentagon. 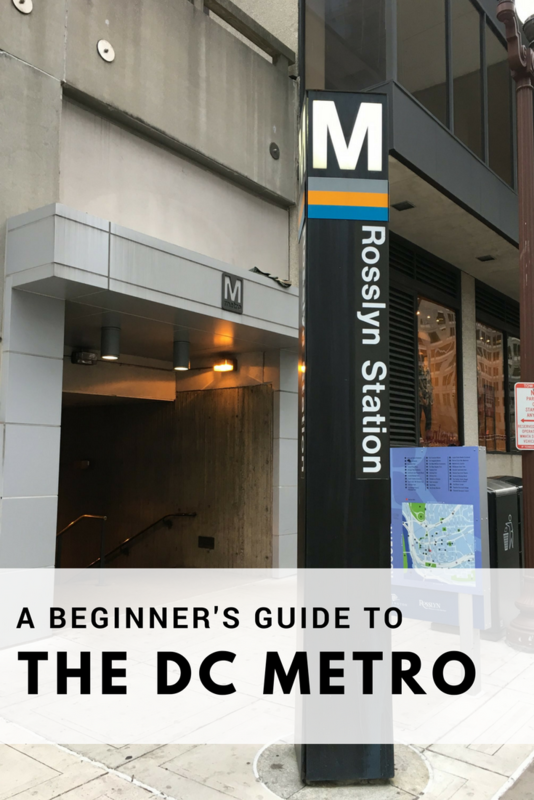 If I’m ever in DC, I’ll probably take the time to go even though it was short and you found it underwhelming. If anything, I think it’d be cool to tell people that I got to visit. We spent a couple of days in DC about 2-3 years back. It’s a really interesting city. We skipped the Pentagon, figuring it would be exactly like you said – offices. I didn’t expect it to be all offices — not sure what I expected, really. I did like getting a glimpse of the inner courtyard and would like to see that again! I have visted the area many times and never done this. Hopefully i can add this to the future lineup. Cant beat free! 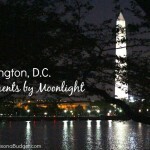 DC and Arlington are both great places for free places to visit! I’ve been to DC many times. I knew you could tour the Capitol Building and the White House (still haven’t done those either), but I thought the Pentagon would be a no-go as well. But, 100,000 people figure it out each year! This your sounds like it would be so interesting!! Our kids learn a little bit about American politics so a tour like this would really help the information to sink in. It is a great place for a military overview.